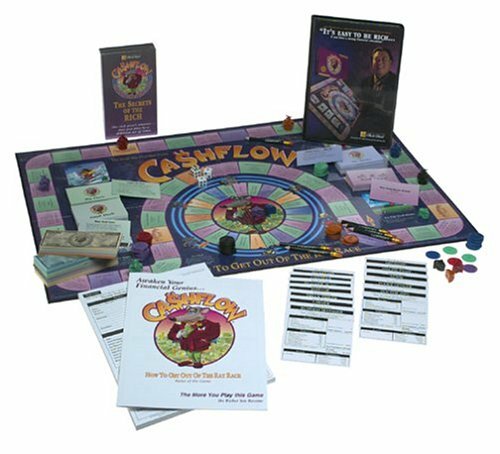 Cashflow 101 is board game created by Robert Kiyosaki, author of the popular book Rich Dad Poor Dad. 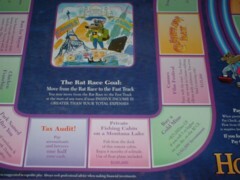 The objective of the game is to “Get out of the Rat Race” and onto the “Fast Track”. Back when I first started investing in real estate I had heard about this game, but the $200 price tag seemed pretty steep for a “game.” I ended up getting a copy for “free” after signing up for advanced training through the Rich Dad Coaching company (see What $15,000 in Real Estate Investing Training Looks Like). Below is my review and experience with the game after playing it ~30 times. 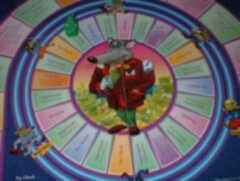 Each player starts out in the “Rat Race,” a small wheel. You will continue on this wheel until your passive income (money gained by not directly working) exceeds your expenses (how much it costs you to live). Each player will randomly draw a profession card. Professions include: Teacher, Engineer, Mechanic, Business Manager, Secretary, Lawyer, Nurse, Janitor, Police Officer, Airline Pilot, Truck Driver and Doctor (MD). Once each player chooses a profession, they will transfer their information (income, expenses, assets and liabilities) to their income statement. As each player takes their turn, they will land on one of the following tiles: Opportunity, Doodads, Charity, Pay Check, The Market, Baby or Downsized. With each turn, you will have the opportunity to make decisions and each decision will impact your income statement. With each decision, you will update your financial statement and your neighbor will “audit” it to ensure that it is correct. Once you build up your passive income more than your expenses, you get “out of the rat case” and onto the “fast track,” which is a larger board. With each turn, you will have the opportunity to increase your passive income and land on your dream. The first person to either land on their dream or achieve $50,000 in passive income is the winner. I am personally a huge fan of Cashflow 101. You can purchase the game for ~$80 today on Amazon as compared to $200 when I first got it. An introduction to personal finance. Many people have never filled out a personal financial statement. This game will show you how to fill out one. Learning a different meaning of Asset/Liability. Traditionally an asset is anything of value and a liability is what you owe. Robert Kiyosaki adjusted this and said anything that bring you money is an asset while anything that takes your money is a liability. This means even though the bank may see your house as an asset, Robert sees it as a liability because the associated mortgage costs you money each month. I think this is an important lesson for people to learn. You can win the game as a janitor or a doctor, so you realize that you can be successful regardless of your current job. Obviously your path and time-frame may vary. My personal favorite: You can vicariously learn the impact of your decisions in a safe setting. There is a lot to learn before actually investing in real estate (or anything for that matter) and mistakes can be costly. With this game, you can try different strategies each time you play and see the impact. Obviously these strategies may only loosely apply to the real world, but you can learn how to problem solve, make decisions and see the impact. I am a huge fan of the Rich Dad Poor Dad book. It completely changed the way that I look at money and investing. I was not a big fan of the training, but I am a huge fan of the game. I think it teaches valuable lessons in a safe setting. I have used the lessons that I have learned in the game to guide my real life investing. I started small, purchasing a single duplex. I followed this strategy for a while to build cashflow. As a result, I have now started moving up to larger investments (we recently purchased a 4-plex). I also expanded outside of just real estate and started a small business. These were all basic strategies that I developed and perfected while playing the game. You will learn basic financial analysis, but there is a lot more specific information that you will need before you dive into real estate investing. For more details into financial analysis for real estate, I would recommend What Every Real Estate Investor Needs to Know About Cash Flow… And 36 Other Key Financial Measures by Frank Gallinelli. Are you in the Rochester, NY area? If so, contact us and we can schedule a time to play Cashflow 101 together and get your started on your road to freedom.